NICE AND EASY: Will a cell booster work if the towers are 50 miles away? Cellular signal boosters take a weak signal from a cell tower and amplify it so you can use it in your home or office. They work very well as long as you have at least one bar of signal outside the building you’re in. There are limits, however, and if there’s no signal outside, then a cellular signal booster isn’t going to do a whole lot for you. In most areas, cell towers are spaced between one and two miles apart. That’s enough to guarantee good service in the areas they serve. While “theoretically” a cell phone signal could go as far as 45 miles, that’s not a really honest projection. A cell phone’s signal is going to be very unreliable after about 2-2.5 miles, and that’s assuming a clear line of sight to the tower. In many cases you’ll only get about 1 mile between towers before the signal starts to get weak, because you’re also looking at trees and other buildings between you and that tower. There’s a simple way to determine if you’ll get good performance from a cellular signal booster: just pick up your phone. Go outside — if you can make a call, if you have any bars at all, then a cell booster will work for you. If the service is dicey, climb up on the roof (if you can.) 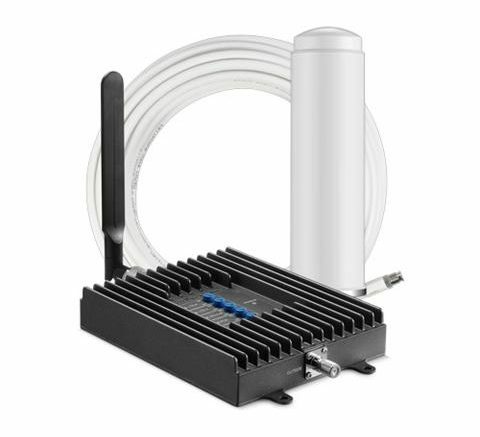 If you have good signal on the roof you will definitely benefit from a cell booster. If you have no service… unfortunately you’ll need to look at other options, such as a microcell from your cellular provider or a Wi-Fi calling solution. Cell Booster or Wi-Fi Extender: Which do you REALLY need? Why can’t you ever get max speed on wi-fi?